Juggling elephants - Success Without Getting Squashed! Feel like the circus is running you instead of you running your circus? Seem like the performers in your circus are less than enthusiastic about being a part of your lineup? If so, it's time for you to stop juggling elephants. In this humorous and thought-provoking message, we offer a unique perspective on the struggle to "get it all done," and some of the less-obvious reasons behind this universal problem. Getting Your Most Important Things Done! To receive a more detailed description of each step and the benefits to the people in your organization, contact us. Training programs are customized to the length of time available – whether a 90 minute breakout session or up to a full-day training program. While the shorter training programs deliver strategies, insights and applications for each module, the full-day training is a deeper cut, allowing more time for application exercises and additional learning. We work with you to design a program that best meets your needs, adding additional content where needed and spending less time on areas not as critical to your people. This program is for those who are interested in being trained and licensed within their organization to deliver a Juggling Elephants Training Program to their employees. The program is designed for 4-6 hours of content or it can be broken into modules and delivered as a series of shorter programs. Resource CD containing PowerPoint, Participant Handouts (PDF) and other support items. The rights to duplicate participant handouts are included in the Certification price. Printed participant guides are also available. Hardcover copy of the book, Juggling Elephants: An Easier Way to Get Your Most Important Things Done - Now! Two hour, "over the phone" training on materials, content and delivery. Onsite training of trainers is also available. Call for pricing. Available on DVD as a part of the Training Kit to help you create engaging sessions within your organization to help people who are struggling with too much to do! 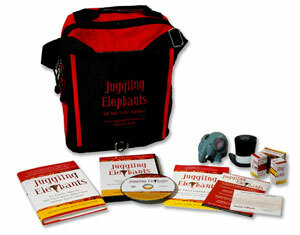 The Juggling Elephants DVD tells a simple but profound story about one individual with a universal problem. Mark has too much to do, too many priorities, too much stress and too little time. Using the circus as a metaphor for his life, Mark shares the secrets that he learned from a real ringmaster. 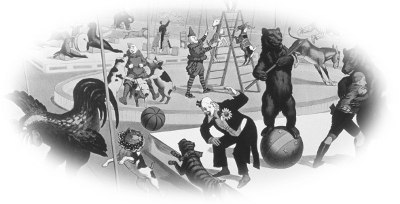 You'll learn that you too can be a great ringmaster of your own life. This DVD is designed for organizations that are looking for a simple way to teach these simple techniques in small group training sessions. The DVD allows your facilitator to (1) play the entire DVD and then discuss or (2) play each act with a pause for discussion of the key messages just learned. Includes a 16-page facilitator guide. Watch the authors explain how to use DVD. This DVD and accompanying guide may be used by the acquiring party for internal use in training its employees only. It is not licensed for use by the acquiring party with any other entities, businesses or individuals, or for any other purpose. Any unauthorized copying, reproduction, recording, distribution, sale, exchange, license, sublicense, exhibition, display, modification or other use of this guide or the accompanying DVD or any part thereof, in any form, manner or medium, is strictly prohibited.